But, I have to be for the sake of getting my three children ready for school every weekday morning. My day begins around 5:30 a.m. and things are usually pretty hectic until the bus pulls up around seven. Having breakfast options that are quick and easy makes our mornings go a lot smoother. 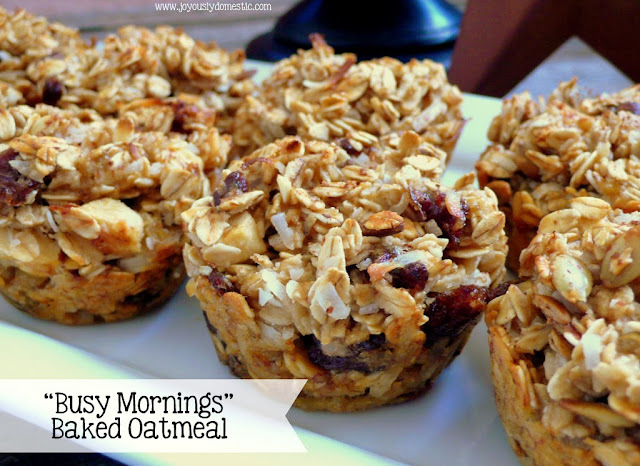 These are perfect to have on hand throughout the week for everyone to grab a quick breakfast. I like that they are full of healthy ingredients and are not overly sweet. Serve warm or room-temperature for a grab-on-the-go breakfast or snack. Or, these can be served hot with milk poured over and a little drizzle of honey in a bowl (and eaten with a spoon). These keep for up to a week, so they are ideal for busy weekday mornings. Combine the bananas, egg, vanilla, milk, brown sugar and salt in a medium mixing bowl. Set aside. Combine the remaining ingredients in a large mixing bowl, then stir in wet ingredients to combine. Spoon into the wells of a sprayed or paper-lined muffin tin. Press down a little with the back of a spoon. Top each "muffin" with a sprinkling of cinnamon. Bake for 25 - 30 minutes or until baked oatmeal is "set." Serve warm or store in an airtight container once cool for up to a week.